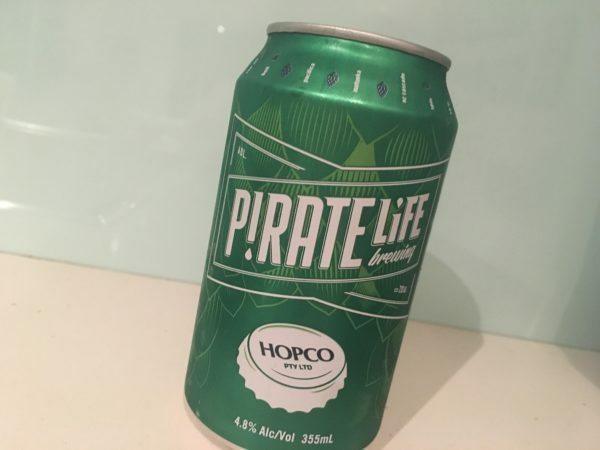 I’m a massive fan of these Pirate Life beers. Love that they’re in cans too – #moretinnies, please! Initially, it seems quite overtly hoppy on the nose, all lime and pineapple. But underneath this is a well balanced number, more inline with the NZ Pale Ale style, the bitterness not intrusive, even though this is a hop, rather than malt, driven style. While the other two hops are Kiwi, Cascade most definitely isn’t. I enjoyed this on tap, although I probably slightly prefer the standard pale ale if I had to choose. I am liking the cans too -better for freshness of the hops, but also because I can fit twice as many cans as I can bottles in the space I have allocated for my beer in the fridge. Love the cans, and I’m probably with you on the standard pale ale. Oh and apparently this is Kiwi grown Cascade hop (Cascade being originally American), I’ll update just to avoid confusion. It’s NZ Cascade, which is similar to the US version, but has slightly different characteristics (there’s also an Australian Cascade).